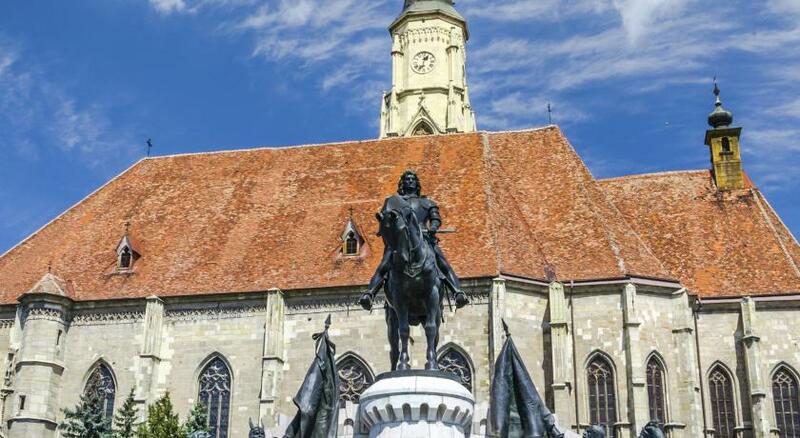 Lock in a great price for DoubleTree by Hilton Hotel Cluj - City Plaza – rated 8.9 by recent guests! Warm welcome from staff and free cookie while they greet us also delicious. Thanks, i know it’s a small detail but made me happy. Free parking outside hotel. Love it. The bathroom was big. 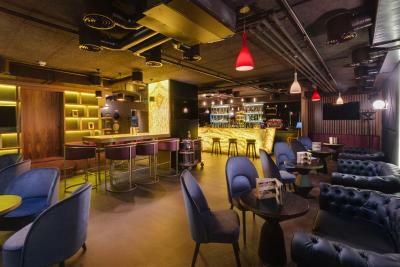 The location is so convenient near Cafe , restaurants and downtown. Also the atmosphere of the hotel is amazing and the room that I was in was great. THE BEST BED THAT I HAVE EVER EXPERIENCED IN A HOTEL! 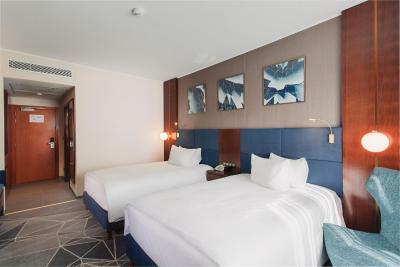 The Beds in the King Rooms are superb (best mattress/pillow, very comfy) than the Double Beds rooms, but there is more storage and the furniture is better in the DoubleBeds ones; especially the lights in the closet help a lot. 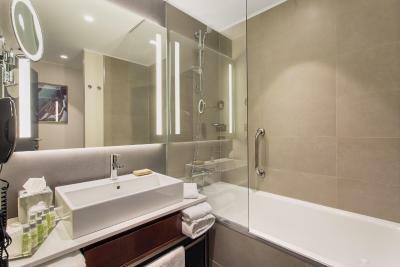 Also the bathtub in the Double is sometimes nice to have, I wish the King Rooms would have showers and bathtubs. I still find the furniture in the King rooms to be odd (like old kitchen corner seating, needs extra chairs/ coffee table, and lights in the closet (it's very hard to see in the back). The restaurant is very pleasant, has good, fresh food and even though it is not very busy at dinner, the menu is appetizing. 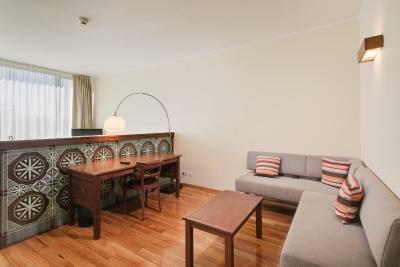 The location is ideal, close to the park, old city center, in the vicinity of good restaurants/ night life and retail. 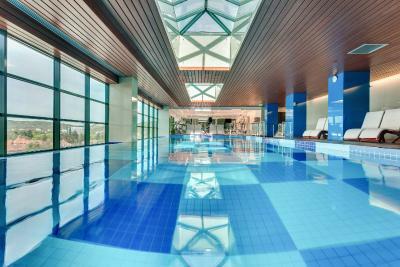 Staff is helpful and knowledgeable, the spa and the pool area are very nice extras. The remote control of the TV was broken: one could barely turn it on, and one could not turn it off, it operated all night long. The shower was broken. So, the hotel room with a disturbing TV and broken shower was disfunctional. 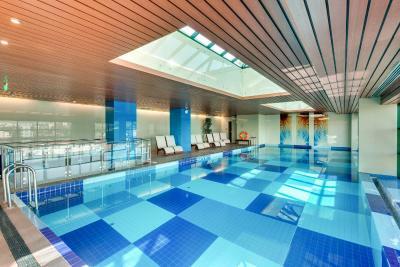 My kids really loved the swimming pool on the top floor. Clean Facility and very friendly and helpful staff. Staff was excellent all around. The facilities were perfect. Everything is new, of high standard and clean. Location is great, right in the middle of the city, walking distance to lots of restaurants and things to do. Very, very comfortable rooms. 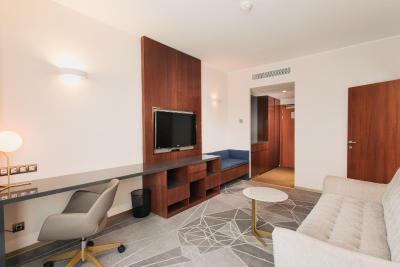 DoubleTree by Hilton Hotel Cluj - City Plaza This rating is a reflection of how the property compares to the industry standard when it comes to price, facilities and services available. It's based on a self-evaluation by the property. Use this rating to help choose your stay! 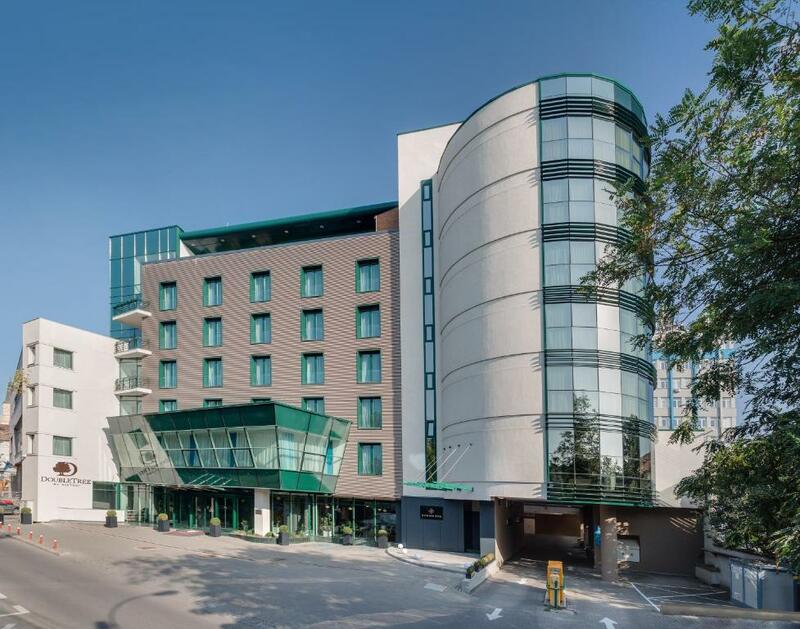 One of our top picks in Cluj-Napoca.Centrally located on a quiet street in Cluj-Napoca close to the main historical landmarks, DoubleTree by Hilton Hotel Cluj offers a fitness area including a swimming pool with panoramic views, free high-speed WiFi and private secured parking. 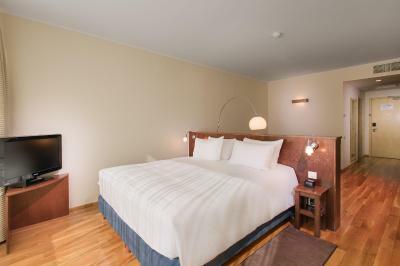 Each nonsmoking room at DoubleTree by Hilton Hotel Cluj features decorations combining modern and traditional design. 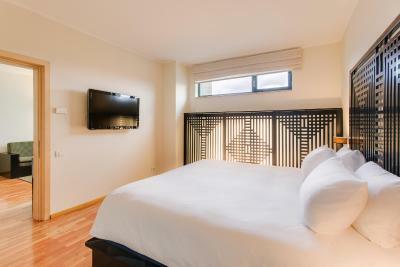 Facilities inside include free WiFi, air conditioning, flat-screen TVs, a mini-bar, a safe and complimentary water. Business guests will find here a spacious working desk. Enjoy a chocolate cookie while waiting for the check-in at the 24-hour front desk. 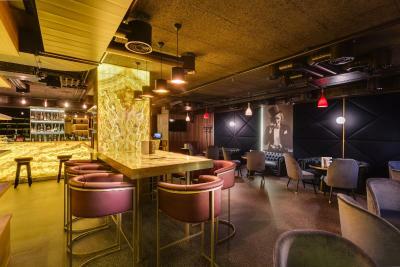 At the Syndicate Bar, guests can unwind with a drink in front. 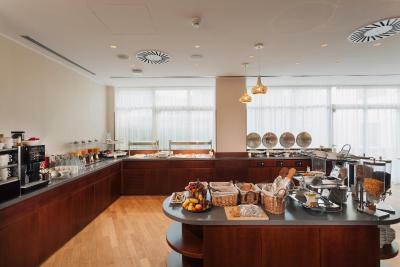 At the Marco Polo Restaurant, you can start your morning with a breakfast, or choose from the local and international dishes from the à la carte menu. Ken Sai Restaurant, located on the 6th floor, offers a panoramic view of the Central Park and Citadel Hill, and the menu features a variety of cuisine blending fresh ingredients with a twist. After a long day, relax at the on-site spa, including a sauna, or burn some energy in the indoor pool or at the fitness center. Massages are available at an extra cost. 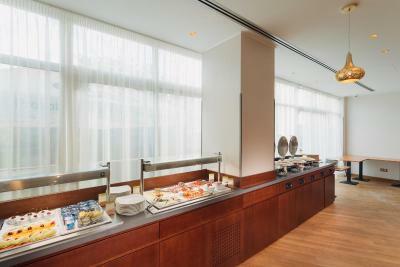 You will also find here a conference center accommodating up to 300 guests, 2 meeting rooms, and a banquet hall. DoubleTree by Hilton Hotel Cluj is also close to many commercial establishments like banks, public institutions and universities, as well as within walking distance from the Botanical Garden, St. Michael's Catholic Cathedral, Hungarian Opera House and National Theater. 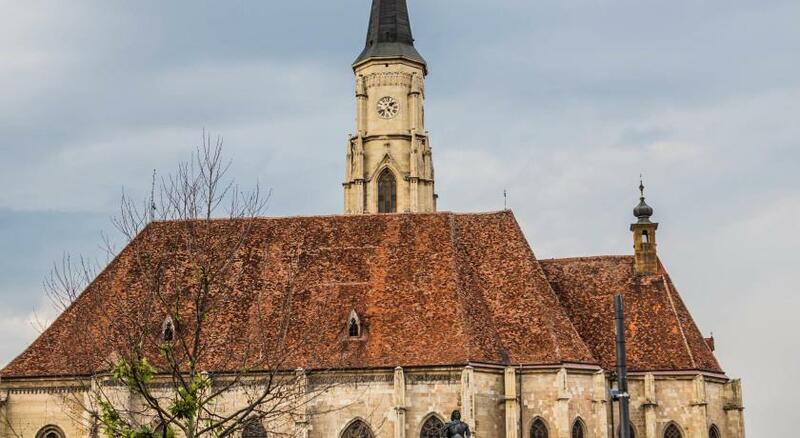 This is our guests' favorite part of Cluj-Napoca, according to independent reviews. 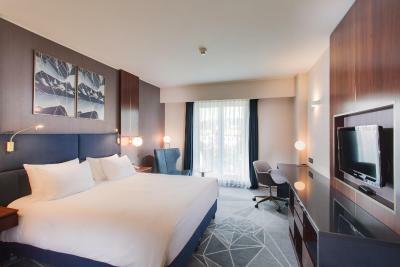 When would you like to stay at DoubleTree by Hilton Hotel Cluj - City Plaza? Relax in this modern and stylish guest room with 2 double beds of 135 x 79 in each. Work is easy with an integrated working area with desk, ergonomic chair and media hub. 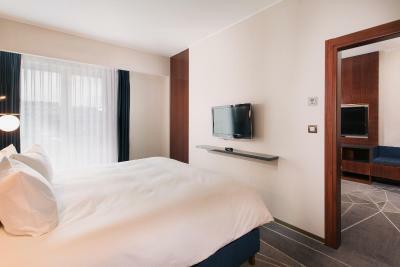 Unwind and watch the 32-inch HDTV with cable channels and stay connected with complimentary WiFi. 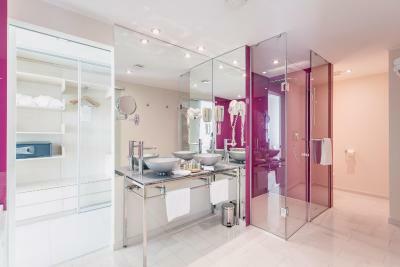 Refresh in a bathroom with handheld shower or bathtub and separate toilet area. Other amenities include a coffeemaker, a mini-bar, air conditioning, a laptop safe and a plush bathrobe and slippers. Private parking is available on site (reservation is not possible) and costs EUR 19.89 per day. 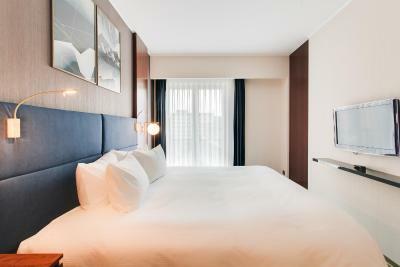 Relax in this modern and stylish guest room with 1 king bed of 180x200 cm. Work is easy with an integrated working area with desk, ergonomic chair and media hub. 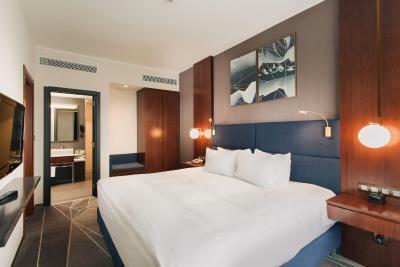 Unwind and watch the 32-inch HDTV with cable channels and stay connected with complimentary WiFi. 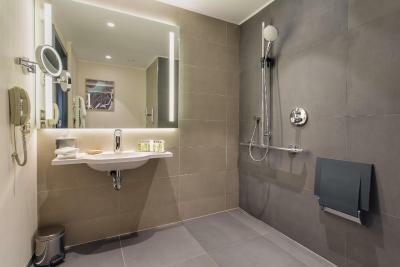 Refresh in a bathroom with handheld shower or bathtub and separate toilet area. 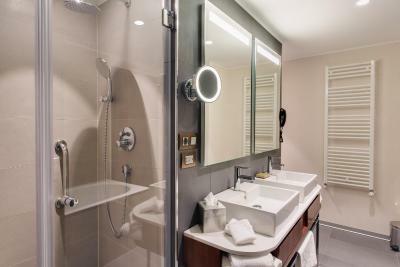 Other amenities include a coffeemaker, a mini-bar, air conditioning, a laptop safe and a plush bathrobe and slippers. Admire views of the park from this modern and stylish room which features separate living and sleeping areas. Brew a fresh coffee from the espresso machine and unwind and watch one of 2 TVs. Work is easy with an integrated working area with desk, ergonomic chair, media hub and complimentary WiFi. 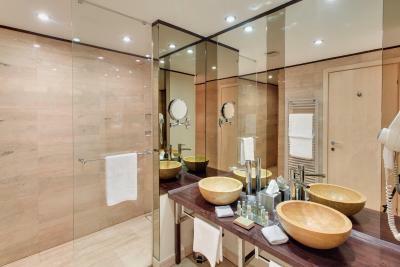 The elegant bathroom features a double washstand. Other amenities include a mini-bar, air conditioning, and laptop safe. 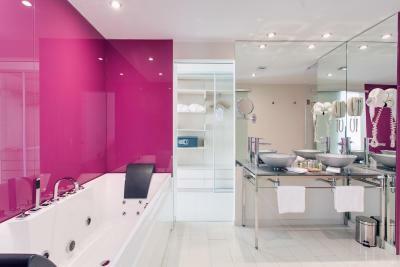 Take in views of the park from this deluxe suite, decorated in a colorful cosmopolitan style. The suite features a king bedroom and a separate living room, with a dining table, leather sofa, and parlor chairs. Both the bedroom and living area are fitted with a TV. 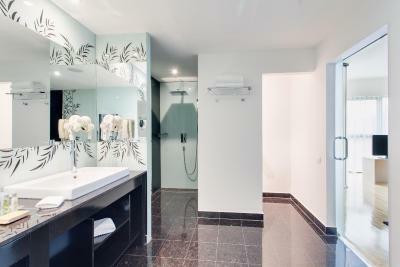 Refresh in the elegant bathroom which has a rain forest shower, and a double sink. Work is easy with an integrated working area with desk, ergonomic chair, media hub and complimentary WiFi. Other amenities include an espresso machine, mini-bar, air conditioning, and laptop safe. Slippers and complimentary water are offered. 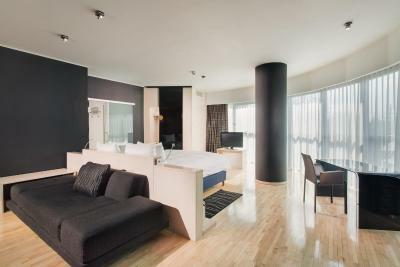 Relax in this modern and stylish one-bedroom suite with 1 king bed of 200x200 cm and one extended sofa. Work is easy with an integrated working area with desk, ergonomic chair and media hub. 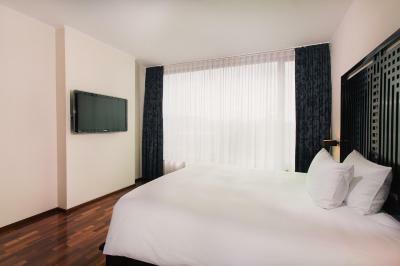 Unwind and watch the 32-inch HDTV with cable channels and stay connected with complimentary WiFi. 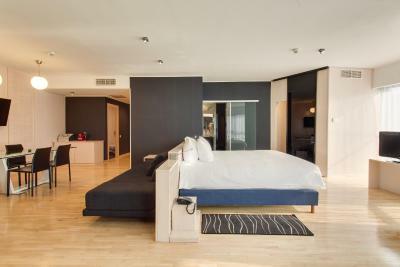 Other amenities include a coffee maker, a mini-bar, air conditioning, a laptop safe and a plush bathrobe and slippers. 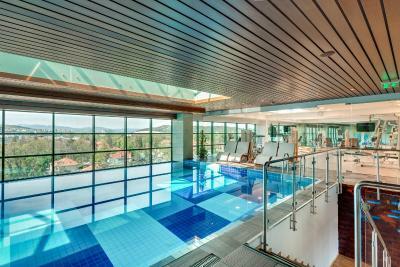 House Rules DoubleTree by Hilton Hotel Cluj - City Plaza takes special requests – add in the next step! All children under 12 years are charged EUR 34.80 per night for extra beds. Any additional older children or adults are charged EUR 34.80 per night for extra beds. DoubleTree by Hilton Hotel Cluj - City Plaza accepts these cards and reserves the right to temporarily hold an amount prior to arrival. One of the most picturesque neighborhoods in Cluj-Napoca! It’s clean, comfortable and centrally located. The breakfast was excellent. The staff were exceptionally helpful in every way. Clean, spacious, excellent central and quiet location. Comfortable bed. Fabulous breakfast. Excellent staff at reception, breakfast and spa. They give you a warm chocolate chip cookie! Pool has a great view and I had it all to myself. Good size too! Breakfast was perfect for me, many choices and they aim to please. Room is a bit business like in decorating with the best bed. Nice view from my room... Location is near an amazing park and all restaurants and shops. Center location. Can recommend this hotel to everyone! Kinda dusty in some part of the room. i have been staying in this hotel when in cluj since 2013 as much as i can. 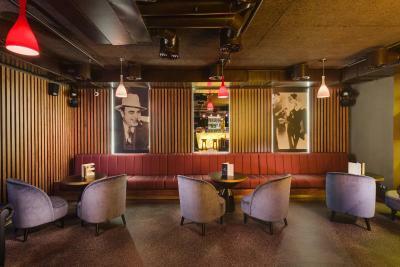 the location is perfect being within walking distance from city centre. 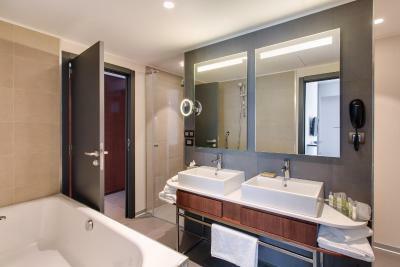 we usually stay in one of the suites that are well designed spacy, comfortable and kept spotlessly clean. suite is very well equipped providing quiet and relaxing environment after a long drive or a busy day. breakfast is outstanding. staff is professional and helpful. Big room very expensive for nothing. The furniture very uninspired for a 5 star hotel. It's a 4 star at best. The fitness centre is poor in facilities and old. Do not expect for that money to receive a 5 star cause is not. Location. It was actually an old 4 star hotel who now is under licence of Hilton. 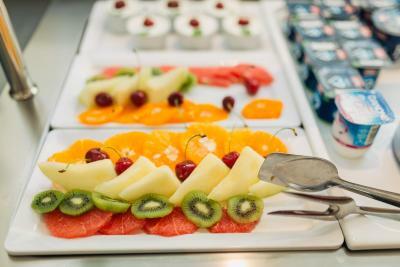 The Breakfast was very good but unfortunattely not included in the room rate. Very expensive for what it is ! Very standard not up to usual Hilton expectations ! Nothing special ! Staff don't communicate very well ! 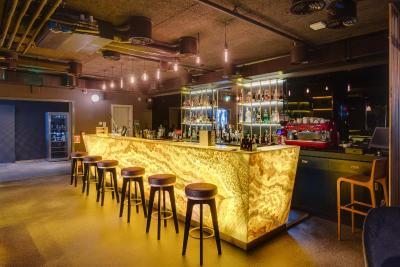 Could not get drink at the bar and charge to our room eventhough they had my card details ! Had to ask for room to be cleaned and restocked !